Gaming has never really been something that BlackBerry was known for. We've had the old-standby Brickbreaker since the start as well as a few good games here and there, but we never had the "latest and greatest". When the BlackBerry PlayBook was released, BlackBerry fans everywhere were overjoyed and gaming on the BlackBerry platform changed forever. With the new hardware, we could now have our share of great games as well. Things have come a long way in the last year, and moving forward to BlackBerry 10, it looks like they won't be slowing down. At BlackBerry World 2012 this year there was a huge BlackBerry 10 vibe, but more so there was a great buzz about gaming. Plenty of big game companies like Marmalade and Gameloft were showing their support and excitement for the BlackBerry 10 platform, and that itself is truly something to look forward to. As BlackBerry 10 approaches, more and more game companies are getting on board and either making new games for the platform, or porting existing titles over since RIM has been making it so easy to do so. 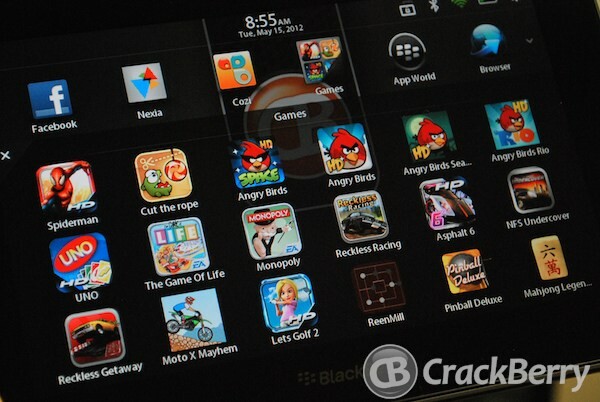 Keep reading and we'll take a quick look at what we can expect for gaming on BlackBerry 10. When the BlackBerry PlayBook was released, we quickly got an idea of the power of the hardware. RIM included both Tetris and EA's Need for Speed Undercover on the device, and both really showed just how much the PlayBook could handle for games. If you look back to the older versions of Need for Speed and other games we saw on pre-OS 7 devices, it's pretty crazy to see the difference and how far we've come. Over the past year we've seen plenty of great titles come along, but only now is BlackBerry getting recognition as a "gaming platform". In the last few months we've seen games like Angry Birds, Lara Croft and the Guardian of Light, Madden 12, Cut the Rope, Plants vs Zombies and Smash Cops all come to the BlackBerry PlayBook. Moving forward we can hope that big-name titles will launch not too far behind their iOS and Android counterparts, which is a huge step for BlackBerry users. It's not hard to see that QNX is miles ahead of the old BlackBerry OS, and thus perfect for gaming. At it's core QNX has the power to do so much, and we can already see that from the current line of available games on the PlayBook. While we don't know the exact hardware we'll see as the guts of BlackBerry 10 phones, you can bet that they will be prime for gaming. Developers and vendors are really excited about BlackBerry 10, so we can expect plenty of great games to be available. Just look at the BlackBerry 10 Dev Alpha device hardware -- it already beats that of some current Android devices on the market, and it's not even a consumer device. RIM committed to doing all they can as far as helping game developers get their content onto the platform as well. They are constantly pushing out software tools, APIs and developer betas to further ensure that developers have no problems porting over existing titles or creating new ones. With things like the cross-platform game development framework, gameplay, you can see how easy they are making it on developers. Some companies have flat out said they would have not ported any games to BlackBerry had it not been for the tools RIM provided. Using "middleware" from RIM, it's easy for developers to get existing or new titles up and running on the BlackBerry platform with little extra effort. Using things like BBM -- which is almost a platform in and of itself -- helps to make games social and bring additional features that wouldn't otherwise be possible. The BBM infrastructure provides the ability to incorporate in-app chats, stat sharing, game discovery and much more. For BlackBerry 10, we will see the social aspect of games continue to grow with things like bigger multiplayer gaming and even more socially enabled titles. RIM plans to release a Games app for BlackBerry 10 as well (yes, much like the iOS Gamecenter). While details are still scarce, this looks to be a central location that will house all of your friends, stats and achievements and act as your social hub for all of your gaming. Rather than having to use each separate game for your records and socializing, the Games app will be the go-to spot for all of your games so everything is all in one place. If you tend to swap off between your phone and PlayBook for games, you won't have to worry about losing your place either. Some titles will allow you to save all of your stats and achievements across devices, so as you progress you can play on any device and always resume from the same place having the same achievements. As we look ahead even further, even something like starting a game on your phone, then resuming it on your PlayBook isn't out of the equation. The Playstation Vita has the option with certain games, but it's still a fairly new technology. Imagine being able to play a game on your PlayBook from your couch, then resuming it on your BlackBerry 10 phone (or vice versa) as you head out the door to the bus stop. Along the line of peripherals - it looks like it's something RIM would embrace for gaming on the BlackBerry platform. A while back we saw this awesome SNES-like controller scheme being used to control a game on a PlayBook, but we could soon see straight up third party controllers or even XBOX/PS2/Wii controllers being used with BlackBerry devices. I think this would be a smart move by RIM -- imagine having your PlayBook hooked up to your TV via HDMI and simply using your standard XBOX 360 or PS3 controller to play a game. The time spent on mobile games has already surpassed that of console games, so that says quite a lot. Hearing what vendors had to say during BlackBerry World about BlackBerry 10, they are all very excited for the new OS. Already they are making more on BlackBerry than on iOS and Android. Having such a huge following of BlackBerry users that are faithful to their brand just makes them want to do more and more. BlackBerry users aren't stingy either - they are willing to spend money on quality apps and games and developers/vendors now see that. They know how profitable the BlackBerry Platform is which makes them crank out quality titles they know will do well. Companies like Gameloft, Square Enix and others already have plans to bring many of their titles to BlackBerry, so we'll continue to see them become available in the coming months. So overall I am really excited about what we'll see down the road for games on the BlackBerry platform. RIM is putting out more tools than ever for developers and they are making sure everyone knows just how great it is to be on the platform. We'll see more big titles heading our way and will have some amazing technology to work with. As we see BlackBerry 10 phones come to market, things like the Games app and more multiplayer titles will take social gaming to a new level. Where some BlackBerry users never considered their device to be a "gaming device" in the past, new (and current) users will not have that view. BlackBerry 10 will be an amazing gaming platform as well that will draw in new users who look for that and have current users dropping their iOS gaming devices all-together. What do you want to see for gaming in BlackBerry 10? Bigger, better games? New features? Sound off in the comments and let us know!